The playoff hopes were dashed, but we still had Ricky. It was fun, and sometimes encouraging to watch Rubio’s ongoing rehab and recovery process after ACL surgery. On March 12, 2013, against the eventual-almost-champ Spurs from San Antonio, Ricky had it all going. He scored 21 points. He pulled down 13 rebounds. He dropped 12 dimes. He messed around and got a triple double. Oh but this wasn’t just substance — “doing stuff” as some like to call it. Ricky’s taken a beating recently in the talk radio and blogosphere as casual fans place a little bit (sometimes a lot) too much emphasis on his shooting struggles. It’s worth remembering games like this one where he destroyed one of the league’s best teams. The silver lining to Kevin Love’s injury was supposed to be the fresh opportunity for Derrick Williams to show off his crazy-cool, number-two-pick-in-the-draft skills. Unfortunately, the opportunity revealed nothing helpful. As we now know, increased sample size sanded his trade value down to Luc Richard Mbah a Moute; a reserve defensive specialist. Nine months later, nothing has happened to change my opinion. We also spent some time doing an AAR of the Wolves season and the way ahead. Nothing can top Kahn’s Last Stand, but we’re still fairly happy with our take on 2012-13. Steve Aschburner broke the story on April 26: David Kahn would not be returning as the team’s POBO. Aschburner also hinted that Flip Saunders would be Kahn’s replacement. Andy G wrote about it here. Kahn’s dismissal was welcome news for many Wolves fans. So why does this qualify as April’s worst moment? A few things. First, Andy and I tended to be more ambivalent about Kahn as POBO, seeing the good along with the bad moves he pulled off. Second, we were constantly entertained by Kahn’s foot-in-mouth interviews. We liked Kahn’s lawyer-speak, large vocabulary, and ability to say exactly the wrong thing with such eloquence and precision. I mean, did this really happen? I just pinched myself but I’m still not sure! Finally, and most important, Kahn’s firing qualifies as a “worst” moment because it’s yet another data point that is consistent with longstanding patterns of failure in how the Wolves have gone about building an NBA basketball team. Having to fire any decisionmaker is never a good sign. Flip Saunders was announced as David Kahn’s replacement and partial franchise owner in late April. In early May we (and all of our readers) were fortunate to have FreeDarko author Dr. Lawyer IndianChief pen an epic post about Saunders; specifically, how Flip’s hiring — for the second time — fits into the greater Minnesota sports culture. No matter how you feel about Flip, if you know Minnesota, you enjoyed that post. (And probably agreed with much or all of it.) Link here. Hindsight has made this less bad news and more “meh” news. We love Anthony Bennett — or what we hope Anthony Bennett becomes, anyway — but he and the rest of last June’s draft have been underwhelming. Still, the Wolves failed to move up in the lottery, and ended up trading down. Had they won a top-three pick, it’s impossible to know what trades — perhaps in conjunction with Derrick Williams — would have been possible. I think we were the only ones who predicted the Wolves would end up with Shabazz. Good on us! (Eds. Note: PDW predicted the Wolves would stand pat and take Shabazz at #9 rather than trading down and selecting him at #14). Here’s some footage of Shabazz that was shot during his workout for the Wolves. Look at him dunk! Shabazz Muhammad has played zero meaningful minutes this year. To be fair, we don’t know what he can do yet, but at the same time, the Shabazz pick hasn’t paid off at all, and the opportunity cost of not taking Trey Burke appears real. Bad on us? For the past couple seasons, thanks to an aggressive pursuit and commitment made by David Kahn, the Wolves had Bill Bayno on their coaching staff. He’s one of the league’s best assistant coaches. He’s DEFINITELY the league’s coolest assistant coach. When Toronto upped the ante with a “lead assistant” offer, the Wolves let him out of his contract so he could pursue the better opportunity. Adelman’s son David took his place. To be a little bit dramatic about this, the whole thing reeks of “Tony Dungy and Mike Tomlin win Super Bowls somewhere else.” (Oh, I guess I left out Brian Billick. Anyone else?) It won’t surprise me if Bayno goes on to have a 10+ year stretch of head-coaching excellence at another stop while the Wolves struggle to find a good replacement for Rick Adelman. Andy and I both listed re-signing Pek as the Wolves’ top priority for the offseason after the 2012-13 campaign. In August, after drawing surprisingly little interest as a restricted free agent, the Wolves inked Big Pek to a 5 year, $60 million deal. Pekovic remains one of the best true centers in the NBA, and is averaging 17.4 points and 9 boards per game so far this season. Yep, Shabazz made a bad first impression with the NBA. We covered it here. Someone–I think Bill Simmons and Jalen Rose–likened Shabazz’s dismissal to this classic scene from Friday. Shabazz is expected to be back at the Rookie Transition Camp next summer. No, not because I made my credentialed media debut. (Though that was fun, too.) Media Day was a highlight because Kevin Love showed up in obviously-good shape. With Love, it’s easy to tell what type of condition he’s in. For whatever reason, he wears it on his sleeve. Or his upper arm anyway. Love’s muscle definition seems to come and go with his cardio conditioning level; to a greater degree than his NBA peers. He’s been great this year, just like he was in 2011-12 when he also showed up with a newly chiseled physique. Add to that his improved passing and jump-hook shooting skills and he’s on pace for one of the better all-around statistical seasons in modern league history. Chase Budinger tore his meniscus during a preseason workout. It’s the same injury he suffered last year and required the same surgery to repair it as last year. Despite the Kevin Martin addition, the Wolves need another shooter. Like Budinger. He should be back soon, but his injury has already cost him 28 games. It will likely cost him a few more. This was bad news in September. We were bullish on the Wolves’ prospects in our season preview. And even though the Wolves barely squeaked by an underwhelming Orlando Magic team in their season opener on October 30, they still won. Maybe this meant the Wolves would find a way to win the close games in 2013-14? All kinds of stuff was working. Kevin Martin was the perimeter scorer we needed. Kevin Love was an all-around beast, showing off new passing skills in the halfcourt and better utilizing an old one — his famous outlet — with new teammate and notorious leaker outer, Corey Brewer. The Wolves were 6-3 at one point with blowout wins over the Thunder (without Westbrook) and Lakers (without Kobe). Perhaps our optimism was inflated by a soft schedule. In any event, people were excited after a hot start. Perhaps as much as any other losses, the pair of L’s at the hands of Brian Shaw’s Gallinariless Nuggz were the reality check on early optimism. After all, Denver is precisely the sort of team that the Wolves need to view as a competitor for a playoff spot. It’s a team they should — and need to — be better than. But the Nuggets are fast where the Wolves are slow and energetic when the Wolves play with peculiar lethargy. In the first loss — at Denver — it felt like the Wolves beat themselves. In the second — at Target center — it felt like the Wolves were just the worse team. The Wolves beat Portland decisively on December 18, 120-109. Portland had an NBA-best 17-4 record at the time, and the Wolves looked flat-out better than the Blazers. The game didn’t even feel as close as the 11-point difference in the final score suggests, because of a late-game Blazers run. Portland is as close as the Wolves have to a true rival. Any victory over the Blazers feels good, but beating them while they were atop of the League was especially gratifying. The Spurs-Wolves game scheduled for December 4 in Mexico City was postponed due to smoke in the arena. We did a Photoshop of it. But that was the only fun to be had from this “game.” Not even being able to play what seemed like an ill-fated game since it was initially scheduled seems to suggest something about Timberwolves Karma. More important, the Wolves have played poorly in December, going 4-6 so far. Weaknesses have been exposed. It’s unclear whether we should still expect a playoff appearance from our favorite team this season. 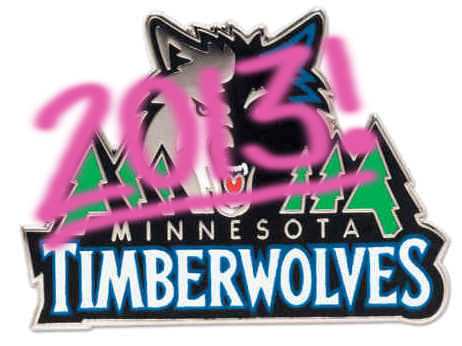 These are the best and worst 2013 Wolves moments that sprang to our minds.